It's time for MAIB to start marketing to this movement! There’s a fan base ripe for the picking. 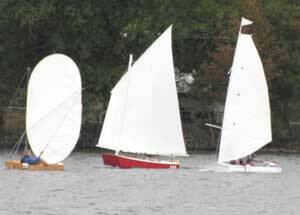 "Cheap, creative, and fun on the water" is the motto of this developmental racing class, and the PDRacer exemplifies its motto. 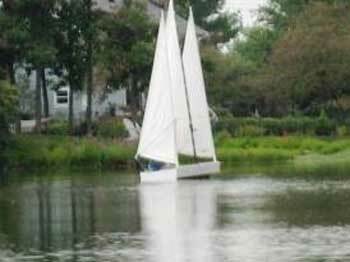 The PuddleDuckRacer was the brainchild of David "Shorty" Routh who conceived the design as an easily-built, flat-sided, 4' x 8' racing scow. The class design specifies that all boats must have the lower 10" of their hulls alike, but the rest is up to the imagination of the builder. Sail plans, interiors, decks, boards, cabins, flotation, and water balloon launchers are all optional. Did I mention cabins? Note the PDRacer in the background of the photo below. Andy Linn and Jason Nabors (background), two PDRacer legends, bring their PDRacers home after a 200 mile trip up the remote Texas coastline in the inaugural Duckworks-sponsored Texas 200. OK. Maybe they were a little confused by then. 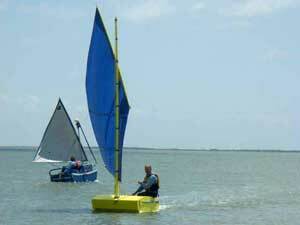 The PDRacer is a great little entry boat for novice sailors and boatbuilders. The first boat is usually built for less than $300.00 from materials that are readily available from most lumberyards. Total construction time is often just a weekend or two for determined builders. By referencing all the information at PDRacer.com or participating in the Puddle Duck forum or accessing the Sail Oklahoma forum site of the 2011 World Championship, newbies soon learn tips and tricks for everything from the holding power of PL Premium to the cut of polytarp sails. And very soon, they are ready for the build of their Puddle Duck #2 and a shot at becoming a Texas 200 Legend, a world record holder, or the next PDR World Champ! Most PDRacers are built from as little as two sheets of 1/4 inch plywood, a few sticks of framing, a polytarp sailmaking kit, waterproof glue, a few screws, and some latex house paint. Some early PDRacer hulls were built for about $100.00. Most builders now spend about $300.00 to build their boats. The cost of plans ranges from free at the PDRacer.com website up to $30.00 by designers who sell plans on Duckworks. High performing sails are invariably made from low cost polytarp sail kits offered by PolySail International Most of the boats in this class fly polytarp sails, and builders who fly high cost sails from professional sailmakers risk being tarred and feathered and ridden out of the primitive camping area on a splintery 2" x 4" mast. Creative The "Practically anything goes above 10" rule" allows for some very creative hulls and sails. Just check out some of the sail plans below from the 2009 World Championship held at Allatoona Lake in Georgia. Few PDRacers are entirely alike, and now a few well-known designers of home-built boats such as Jim Michalak and John Welsford have begun to offer their own plans. Builders are rarely satisfied with just one boat and specialty designs have been built for racing, cruising and record-setting. 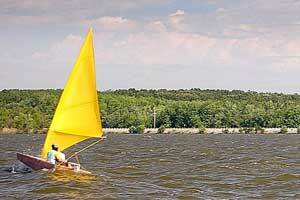 In the photo below, Kenny Giles set an American speed record at a 2007 messabout at Rend Lake, IL. In this photo, PolySail founder Dave Gray is attempting to set a record for the most sail carried at 164 sq. ft. on three masts. PDRacers have amazed many builders with their seaworthiness and participate annually in the Texas 200—a 200 mile sail along the isolated south Texas coast. Built-in flotation is a requirement for safety, and with a 600+ displacement at the waterline, a PDRacer can hold a really hefty crew of two or several members of the family, including pets. 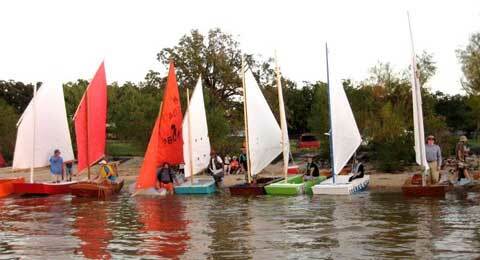 Regional fleets typically gather to race as part of a "messabout" that is part camping, part racing, and all good fellowship. For the last two years PolySail International has produced a calendar listing many of these events. Funds raised from the sale of calendars go to support both PDRacer.com where the rules and membership are listed, and the Sail Oklahoma website. After the success of last year's regional messabout (see photo below), this year's world championship will take place on Saturday, October 8 at Lake Eufaula, Oklahoma. A minimum of 30 PDRacers are expected to line up to compete for the title. However, the real draw is not the race, as most experienced "duckers" know - it's the fellowship and the food. Hosts Mike and Jackie Monies take southern hospitality and cooking to the extreme, and the meals are delicious and massive! I believe some people build PDRacers just so they can qualify to eat cowboy cookies! Readers (and editors), if you are truly an afficionado of messing about in boats, it's time to go build a Puddle Duck and remember what messing about is all about.